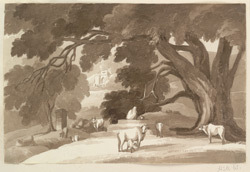 Sepia wash drawing of a landscape with a well and cattle in Bihar by Harriot Mary Woodcock (b. 1807) in January 1831. Inscribed on the reverse is: 'Umrit Horan. Janry. 1831 Gyah' and on the mount 'HMW'. Bihar, situated in eastern India, bounded by Nepal to the north and Jharkhand to the south is divided by the Ganges River which flows through the middle of the Bihar plain from west to east. Derived from word ‘vihara’ or monastery Bihar was the early home of Buddhism and has been settled and cultivated for hundreds of years probably since the 6th century BC. The East India Company obtained draught bullocks for the Ordnance from the region.